Every business has numerous records that they need to maintain for different purposes. Each document may not be needed every single day, but often there are certain documents that a business is required to have on hand for legal purposes, such as contracts or financial records, or for specific situations, like injuries or a violation of company policy. Because there are so many documents that a company needs to have on hand, every company has an established method of organizing and retrieving their records. 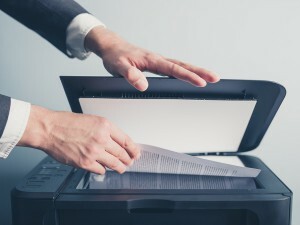 Document scanning has helped many businesses make this process a little easier. Establishing a document scanning service for your company allows you to manage any and all of these files much faster, while using much less space than you would with a paper management system. Document scanning works just as it sounds- each of your documents are scanned to a computer filing system. You are able to organize the documents in any way that makes the most sense for your business, as well as choose who gets access to each file. Scanning your records also makes the document retrieval process a little faster. With a paper filing system, the associates have to search through files, and each document within these files, to find the one that they need. With a scanning system, rather than having to search through a bunch of other papers, the associate is able to simply type in an applicable keyword for the specific document in order to pull up the one that is needed. Another advantage of implementing an electronic document management system (EDMS) is that there is no need to worry about losing the company’s records. Paper filing may be practical, but what if some type of natural disaster were to happen at your company’s office? How would your documents be protected from a situation such as a fire or a flood? With an EDMS, all of your files are stored electronically. This means that in the event of a disaster, there is no chance that they will be ruined or lost. Document scanning gives you peace of mind in knowing that even if a disaster were to happen, your records will be kept safe and accessible. Ready to Convert to a Document Scanning Service? Record Nations is Here to Help! If document scanning sounds like the perfect solution for your business, let us help you make the transition. Our experts are prepared to give you a quote within minutes. Just fill out the form on the right, or give us a call at (866) 385-3706.